No U.S. intervention anywhere. 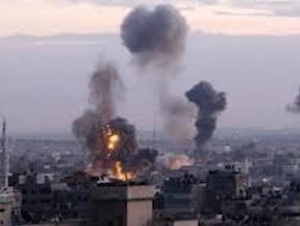 End all support and aid to repressive regimes and all military and police training aid everywhere. End efforts to destabilize foreign governments. End U.S.-directed economic warfare against other countries. Abolish the CIA, NSA, AID and other agencies for interference in other countries’ internal affairs. Withdraw all U.S. troops and weapons from all other countries. Convert from military to peaceful production; reallocate the resulting “peace dividend” for social benefit. Eugene Ruyle, Emeritus Professor of Anthropology and Asian Studies at California State University, Long Beach, was the Peace and Freedom candidate for State Assembly in 2012 in the 15th District (Oakland, Berkeley, Richmond), winning 25,167 votes, or 13.2% of the total. Ruyle is preparing another campaign for 2014. For further information, visit his campaign web site at ru4peace.wordpress.com or contact him at cuyleruyle [at] mac [dot] com or 510-428-1578. Debt is a tie that binds the 99%. As individuals, families, and communities, many of us are drowning in debt to Wall Street for the basics of life, food, housing, education, and health care. Even those of us who do not have personal debt are affected by predatory lending through our friends and families. Our essential public services are cut because our cities and towns are held hostage by the same big banks that have been bailed out by our government in recent years. Entire nations are suffering because of crushing debt to the World Bank and IMF, creating new forms of international slavery. In contemporary society, not only are students, consumers, home buyers, the sick and elderly drowning in debt, but also city and state governments, even whole nations, are in debt to the 1% and Wall Street. This is nothing new. Credit has played a crucial economic function for thousands of years. However, since control over the credit, banking and monetary systems has been in private hands, credit and debt have been used to enslave working people and the poor for thousands of years. Resistance to such slavery is also as old as history. Debt cancellation is firmly rooted in Judeo-Christian social teaching as well as socialist and anarchist thought. The Book of Leviticus refers to the Year of the Jubilee, in which all debts are cancelled, all slaves are freed, all land is restored to its original owners, and community is restored. Such debt cancellation is well documented in ancient Mesopotamian history. This ancient social teaching has given rise to groups—such as Jubilee 2000 at the WTO protests in Seattle and the Jubilee USA Network—that call for the definitive cancellation of crushing debts to fight poverty and injustice in Asia, Africa, and Latin America. The Paris Commune of 1871 attempted to implement this by issuing a decree providing for payment of all debts in installments over three years and abolition of interest on them. Marx termed this a “sagacious settlement” (The Civil War in France). The Commune was crushed by French troops within three months and therefore unable to implement this decree. The Occupy movement has given rise to Strike Debt, formed to organize debt resistance and imagine and create a new world based on the common good, not Wall Street profits. 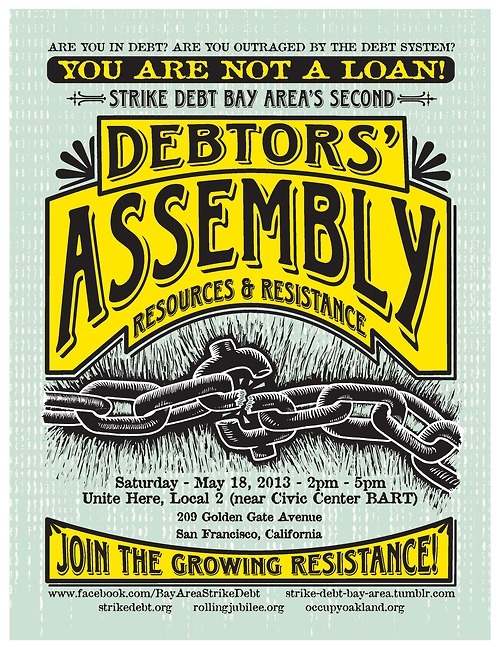 Strike Debt Bay Area organized Oakland’s First Debtors’ Assembly on February 2, 2013, and is continuing to organize in the Bay Area. Such socialization of the institutions of finance and credit would lay the basis for an open and democratic process to cancel those debts that are found to be illegitimate and unjust, a process that would undoubtedly focus on most student debt and the excessive fees, fines, and usurious interest rates associated with predatory lending. Perhaps this could be done through community Debt Cancellation Boards similar to, but more effective than, the Rent Control Boards in various cities in California and elsewhere. Or perhaps some other form of direct action might be appropriate. The call for debt cancellation is a revolutionary proposal, appropriate for a socialist party such as Peace and Freedom. There have been significant efforts to reform the abuses of our credit and monetary systems, but such reforms can only temporarily relieve the abuses of what is essentially an exploitative, corrupt, unstable, and unjust financial system. These abuses, and the human suffering they entail, will continue as long as capitalism continues and as long as money, banking, and credit remain in the private hands of the 1% and are not under open and democratic control to serve the people. That’s why we need socialism. This call for debt cancellation is intended to move us toward this goal. Eugene Ruyle, Emeritus Professor of Anthropology and Asian Studies at California State University, Long Beach, was the Peace and Freedom candidate for State Assembly in 2012 in the 15th District (Oakland, Berkeley, Richmond), winning 25,167 votes, or 13.2% of the total. Ruyle is preparing another campaign for 2014. For further information, contact him at cuyleruyle [at] mac [dot] com or 510-428-1578..
Two words, socialism and capitalism, shared the top spot for lookups in 2012, shedding light on “topics and ideas that sparked the nation’s interest,” according to a recent report from Merriam-Webster, Inc. The dictionary publisher cited the healthcare debates and presidential race as contributing factors, but interest in socialism and capitalism is bound to increase as Americans feel the continuing pain of economic crisis. Socialism: We support social ownership and democratic management of industry and natural resources. Under capitalism, the proceeds of labor go to the profits of the wealthy few. With socialism, production is planned to meet human needs. To us, socialism is workers’ democracy, including the principle that all officials are elected, recallable at any time, and none receives more than a worker’s wage. Socialism can only be brought about when we, the working class, unite and act as a body in our own interests. Our goals cannot be achieved by electoral means alone. We participate in mass organization and direct action in neighborhoods, workplaces, unions and the armed forces everywhere. As an open, multi-tendency, movement-oriented socialist party, Peace and Freedom does not impose on its members a single, rigid view of socialism or the strategies and tactics of how to achieve socialism. We agree, however, that socialism is necessary and that it will open up a democratic decision-making process for appropriate use of resources and distribution of labor. While Americans may be mis-educated and mis-informed about socialism, this is not the case in the rest of the world. The world’s two most populous countries, China and India, have both incorporated socialism into their constitutions, while socialist and communist parties regularly get strong support throughout Latin America, Europe, and Asia. Most recently, we have seen the electoral victory in Venezuela of the successor of Hugo Chávez, Nicolas Maduro of the United Socialist Party. Socialism is not dead, contrary to some pundits, but remains alive and very much on the global agenda. As socialists in the heartland of global imperialism, we have a special responsibility to our comrades around the world: shut down the war machine and make the transition from capitalism to socialism as rapidly and painlessly as possible.